This formula states that the equivalent energy (E) can be calculated as the mass (m) multiplied by the speed of light (c = about 3×108 m/s) squared. Similarly, anything having energy exhibits a corresponding mass m given by its energy E divided by the speed of light squared c². I had a relatively simple thought,… as usual… to look up Albert’s famous relativity equation on the internet! Using the internet saved me a great deal of energy since it was almost as fast as the speed of light. It was much easier than opening my old physics textbook… a real no-brainer! I equated that I did not think that this famous inventor-philosopher would call me an idiot since I did this research in the state of mass! 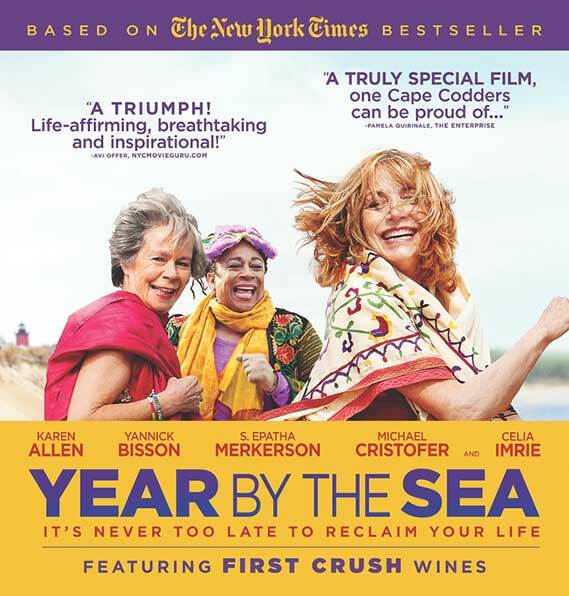 I hope you all get to see this must see film for all Cape Codder’s “Year By the Sea”. It is based on a New York Times bestseller of the same name by Joan Anderson. Joan’s husband is a big fan of our wines. They feature First Crush wines in the film. Currently, the movie is playing in select theaters on Cape Cod. 160 First Crush fans ate. drank and got merry at our recent Memorial weekend social. Many thanks to all that helped and participated. Cajun Bob and the band were a hit as usual. People were dancing on the crush pad auditioning for our grape crush in September. Bob hinted that at our harvest social in early September he will release a long overdue First Crush jingle. Unless you are waiting for our 2016-17 cab and zin, still hibernating in oak, you can come anytime to pick up your COOP 2015-16 reserve anytime. I will begin bottling the new reds late July. Please note that I am not signing up members for 2017-18 COOP until mid-July. I will announce next year’s COOP incentive for early sign-ups in my July update. At that time, I will also announce the specifics of a slight cost increase for the COOP reserve for this next season. I have not had a pricing change on our wines since before we opened the winery in 2012. Everything else has gone up in cost over the years… everything except your COOP reserve. I have resisted this, but it’s time. If you love our Amore, and since we only made 128 cases this season, I can predict that it will soon be in limited supply. We sell Amore and others in the winery to non-members for $25.00 per bottle. COOP members pay a maximum of $15.00. It sounds like bad business for us, but as I have said often, COOP members come first. Get here before the end of June to be safe. Since there is a limited supply, we will be limiting Amore to one case per member. So, if your looking for love, see you soon. Since Memorial Day weekend, visitors to the winey are stopping by for tours and tastings more and more each day. Also, our parking lot is directly on the Rail Trail and we are a key recommended stop on the bike trail map. I promised Diane we would not work more than a seven day work week. She did not think that was funny!